Subtitle: One of the most repeating propaganda lies which Homeland Security and the FBI have deceitfully forced upon the American people is that terrorists have a nuclear device in the United States which they can detonate at any time. We shall demonstrate that this "terrorist alert" is totally bogus. When/If a nuclear terrorist attack does occur, all Americans must know that American officials working on behalf of the Illuminati did the deed -- just as they carried out the 9/11 attacks. One of the most frightening scenarios a person can possibly imagine is a terrorist nuclear device being detonated in a major city. After the attacks of 9/11, this fear escalated in our minds. 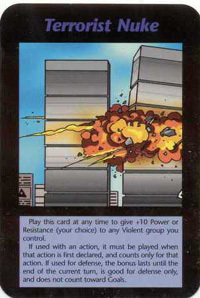 As you look at the World Trade Center card at the left (Read NEWS1753 for full details), you will notice that, even though the headline reads, "Terrorist Nuke", the card portrays that the World Trade Center being attacked in exactly the place where the first plane hit the North Tower. This card could also be referring to two terrorist strikes on New York City. We have already suffered one terrorist attack -- on 9/11. Does this card indicate that another terrorist attack is coming, this time with a nuclear device? 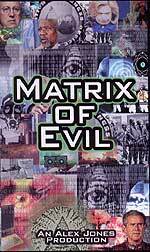 This possibility is greatly strengthened when we examine the writings of one influential New World Order author, William Cooper. Former occultists -- now Born Again -- have reiterated this fact: New York City is targeted to be destroyed by a nuclear device as part of the global plan by which the terrors of World War III will erupt upon the world, so that final birth pangs war designed to allow Antichrist to appear on the world scene. Let us now view the current warnings of Al Qaida possessing nuclear weapons inside this country. As we proceed through these news articles, carefully note the date. "A new book written by a former FBI consultant claims that al-Qaida not only has obtained nuclear devices, but also likely has them in the U.S. and will detonate them in the near future. These chilling allegations appear in "Osama's Revenge: The Next 9/11: What the Media and the Government Haven't Told You," by Paul L. Williams (Prometheus Books). Williams claims that al-Qaida has been planning a spectacular nuclear attack using six or seven suitcase nuclear bombs that would be detonated simulantaneously in U.S. cities.
" 'They want the most bang for the buck, and that is nuclear," Williams told NewsMax. 'I expect such an attack would come between now and the end of 2005', the author said." "Williams' contention is not far from what U.S. intelligence believes, a source close to Homeland Security Secretary Tom Ridge has told NewsMax. The source said Ridge claimed that U.S. intelligence believes terrorists already have smuggled into the U.S. actual atomic devices, as opposed to so-called 'dirty nukes' that simply are conventional bombs that help spread radiation." If you check our huge study of repeating headlines in NEWS1888, you will discover that this type of warning has regularly appeared in American news media ever since the 9/11 attacks. Yet, not one of the alerts has come true, for the simple reason that they are conditioning warnings, designed to so frighten us that we will allow our government to dissolve our Constitutional Republic and impose a severe dictatorship as the price we must pay in order to "defeat terrorism". Therefore, NewsMax has now just repeated the master propagandist's lie: Al Qaida possesses nukes and has them positioned now in this country, waiting for the time to launch an attack. Before we review these previous nuclear bomb / dirty bomb news stories, remember that one of the lies upon which Bush/Blair justified their invasion of Iraq was that Saddam had established close ties with Osama bin Laden, thus enabling bin Laden to receive nuclear devices from Iraq. This lie has been fully exposed by the recent Senate Intelligence report and by the Lord Hutton and Lord Butler reports from Great Britain. But, once you get to the very end of this article, you will realize that even these official reports are absolutely bogus. However, this truth does not stop the propagandist from repeating the scary headline: "Al-Qaida Has Nuclear Weapons Inside U.S."
Now, let us quickly review some of the previous dirty terrorist bomb scare stories in the past, using Daily News Updates Archives as our source. "Could the next terrifying attack on the nation fit into a suitcase? The prospect that Osama bin Laden's terrorists may have gotten their hands on small, easily transportable "suitcase nukes" has some people in Washington now truly concerned ... 'I can tell you unequivocally we built these devices similar to this and so did the Soviets during the Cold War', said Rep. Curt Weldon, R-Pa. 'The defense minister of Russia told me to my face, 'Yes, congressman, we built these devices. Just as your country built them during the Cold War.'" In fact, the Department of Defense made a training video in the l960s, demonstrating how 'small atomic demolition munitions' can be stuffed into parachutes and attached to Navy commandos, who then show how the weapons can be affixed to bridges and ships underwater.
" 'These devices were designed to be used to take out major infrastructure facilities', said Weldon ... The general, formerly Russia's leading defense adviser, said 86 of 132 suitcase bombs were unaccounted for. Where were the missing nukes? President Bush this week sounded the alarm about bin Laden's suspected efforts to go nuclear. 'They're seeking chemical, biological and nuclear weapons', Bush told leaders of formerly communist states Tuesday in Warsaw, Poland. 'Given the means, our enemies would be a threat to every nation and eventually to civilization itself'." Remember this warning is coming from the same President who told us unequivocally that Saddam possessed Weapons of Mass Destruction and the means to quickly deliver them -- a statement we now know was completely false. This article then switches quickly to a related subject designed to terrorize us all: the existence of a "nuclear black market" in Turkey. "But Allison and most other experts say the real concern is not the suitcase but a thriving nuclear black market, in places such as Istanbul, Turkey. 'There is a black market in weapons-grade uranium. There is a black market for weapons-grade plutonium. And there certainly is a market for radioactive material in general', said Freidrich Steinhausler of the University of Salzburg in Austria. Steinhausler is one of the world's pre-eminent experts on the illegal market in stolen nuclear materials. In black markets, the product for sale is usually hidden behind walls of ordinary houses; however, sometimes a black market functions rather openly, depending upon the acquiescence of local authorities who know where the market is, but leave it alone. However, in a black market, the product for sale is usually located there. Keep that in mind when we get to the end of this article. Frightening scenario? You bet it is, just as it was designed to be. "Former Israeli Prime Minister Benjamin Netanyahu warned Monday night that Mideast terrorists are determined to obtain nuclear weapons, and when they do, they will use them on New York City. 'They're going to attack America again and again', Netanyahu told Fox News Channel's 'Hannity & Colmes'. And the great danger that we face is ... if they acquire nuclear weapons - if any part of this terror network acquires nuclear weapons - they will use it. And history as we know it will come to pass." "It's the nuclear equivalent of box cutters. No atom-splitting required. It's called a "dirty bomb," assembled from TNT and radioactive material. Elite scientific SWAT teams stand ready for larger nuclear attacks, but their plans, conceived during the Cold War and refined before Sept. 11, were not made to guard against a small bomb in a backpack or a truck. To address such a terrorist threat, experts say, more needs to be done -- from tighter security at hospitals and labs handling radioactive ingredients to better sensors and tracking at U.S. ports and borders." Notice that the solution for this proposed disaster is to tighten surveillance all throughout our society, from civilian hospitals to American ports and borders. When the real goal is to establish a dictatorship, such tightened control makes perfect sense. Under the guise of "fighting terror", our officials are merely setting the stage for the overthrow of this Constitutional government. Remember, no government whose officials are elected can be allowed to stand when Antichrist arises on the world scene. Since his global government will be dictatorial, all governments throughout the world will have to be dictatorial. This article continues to spew out frightening details of the capacity of a nuclear "dirty bomb" to kill and to panic. "Unlike a nuclear weapon, which might kill 100,000 in lower Manhattan, the congressionally chartered National Council on Radiation Protection says damage by a conventional bomb used to scatter radioactive dust would be limited to a few square blocks. Those uninjured by the blast but near enough to absorb or swallow the dust would face an increased risk of premature cancers and other diseases. Mostly, though, a dirty bomb 'would create a nuclear panic', said Amy Sands of the Monterey Institute of International Studies in California. 'There is a psychological dimension related to anything nuclear', she said, 'and terrorists would be exploiting that fear' ... In most cases, the radiation council says, people's fears would be far greater than the actual danger." Fear is exactly what the propagandist desires through these headlines. What did Jesus foretell in the Last Days? While this verse is set toward the end of the Great Tribulation, this atmosphere of fear seems prominent throughout the time of Antichrist. Remember, we are in the last of the "Birth Sorrows" (Matthew 24:6-8), so we should not be surprised to see this atmosphere of fear permeating our news. In fact, when you carefully contemplate the "birth sorrows" of "wars and rumors of wars" in this passage, you realize that intense fear is inevitable. We are in this period right now; in fact, these many bogus warnings are simply fulfilling the "rumors of wars" prophecy. Now, let us review another ancient article about Osama's terrorists possessing nuclear bombs. This article tells about the increased vigilance by our elite forces. "In Afghanistan, the U.S. military  combing through the Tora Bora mountain cave complex 300 miles northeast of Kandahar for Osama bin Laden, his top lieutenant, Ayman al-Zawahiri, and 1,000 al-Qaida fighters  were ordered to switch their priorities around. Their top objective now is to locate al-Qaida's weapons of mass destruction  including nuclear devices  in a desperate race against the clock. According to intelligence sources, some 3,000 special forces commandos from the United States, Britain, Germany and Russia are currently scouring the cave warren of Tora Bora  which means black dust  for suspected weapons stores. "The latest intelligence reports in U.S. hands claim that al-Qaida chiefs removed their nuclear, biological and chemical weapons arsenal from secret hideouts in Kabul to Tora Bora six days in advance of the Sept. 11 attacks in New York and Washington ... Bin Laden and his partner, al-Zawahiri, are now reported to be planning to take advantage of the slowdown in U.S. air activity forced by the inclement weather to complete their preparations for massive pre-Christmas terrorist strikes in the United States, including a possible nuclear or radiological weapon attack. The target period referred to was between Dec. 5 and Dec. 20. Al-Qaida's operational teams were described as standing by at the various departure points, some waiting only for the delivery of explosives, others just for their last order to go ... A nuclear terror alert was declared in the United States Dec. 4." On the day after the deadline reported in the WorldNetDaily article, UPI resurrected the threat of terrorists using a nuclear device. "WASHINGTON, Dec. 20 (UPI) -- The leading congressional expert on Russia's small portable nuclear weapons told United Press International that the FBI has stepped up its investigation of whether al Qaida or other terrorist groups have acquired these deadly devices from Russian stockpiles. "Rep. Curt Weldon, R-Pa., Chairman of the Research and Development Subcommittee of the House Armed Services Committee, said Tuesday that he was briefed by the FBI late last week and that the investigation of whether terrorist groups have weapons of mass destruction, particularly nuclear devices, is now a top priority at the bureau after years of indifference ... 'Now they're looking at everything and following up on every lead', Weldon said. It was Weldon, through his R&D subcommittee, who produced over past three years some of the most exhaustive and startling information about the Russian stockpile of weapons that could be an advantage to Osama bin Laden, his al Qaida network or other terrorist groups ... In 1997, Weldon brought former Russian security chief Gen. Alexander Lebed before his committee. Lebed testified that perhaps 100 small nuclear devices were missing from inventories under his control. Lebed said the devices were a 'perfect terrorist weapon', made to look like suitcases, "and could be detonated by one person with less than 30 minutes of preparation', according to committee documents." "Recently, two fascinating topics have grabbed the attention of the Western public: speculation that Russians had sold 'suitcase nuclear bombs' to al-Qaida terrorists ... and an outbreak of terrorist incidents in the Central Asian ex-Soviet republic of Uzbekistan. These two matters are linked, for as I previously wrote in TCS, Uzbekistan sits in the middle of a dangerous nest of nuclear, ex-nuclear, and aspiring nuclear powers, including its former ruler, Russia; its neighbor Kazakhstan; nearby Pakistan, and China. In addition, the problem of Wahhabi terrorism, backed by the extremist religio-ideological bureaucracy in Saudi Arabia, is as undeniably deadly as the explosions carried out by suicide bombers in the streets of Tashkent in the past few weeks." "But are 'suitcase nukes' a serious danger for global security?" "... handling of nuclear explosives is no work for amateurs. The specter of 'suitcase nukes' has elicited extensive and authoritative comment from experts in the field, such as Nikolai Sokov and William C. Potter, who are published by the Monterey Institute for International Studies (see, for example, http://cns.miis.edu/pubs/week/020923.htm) ... But evidence available from open sources suggests, first, that the probability that "suitcase nukes" were indeed stolen or sold to terrorists is low, and that if they were, their effectiveness has become diminished by the passage of time. 'Suitcase nukes' are not something one can store in a basement and use whenever one feels like it. They require regular maintenance and replacement of components, and in the absence of their handling by technicians, they would probably have little or no effectiveness..."
Indeed, if any nuclear device is allowed to go past its maintenance schedule, the bomb will not work much beyond that time period. The only damage such neglected nuclear devices could then cause is if the terrorists would blow them up with conventional explosives, spraying contamination into the air, where it would be dispersed by local winds. This type of use of a nuclear device is called a "dirty bomb". Since Lebed went public with his claim in 1998 that Russia was missing 100 suitcase nukes, technical knowledge as we have given, above, appeared so regularly that the scare tactic quickly shifted to "dirty bombs". In these propaganda articles, you will find references to suitcase nuclear devices and to "dirty bombs". However, as we shall see later in this article, America possesses the technology to discover and precisely locate any device emitting tiny amounts of radiation. Now, let us shift our attention to Pakistan in an article which appeared in early December, 2001. "ISLAMABAD, Pakistan - Pakistani nuclear scientists, in collaboration with former Pakistani intelligence officers, were assisting Osama bin Laden's al-Qaeda organization in developing a 'dirty' nuclear weapons capability, U.S. and Pakistani intelligence agencies concluded, United Press International learned Thursday ... intelligence officers in Washington and Islamabad are convinced documents uncovered in Kabul and the interrogation of nuclear scientists, who were frequent visitors to Taliban-ruled Afghanistan ostensibly involved in humanitarian work, are conclusive evidence al-Qaeda was trying to put together a 'nuclear device in the 'dirty-bomb' category." Notice the words denoting a definitive meaning used in this article: "conclusive evidence". This is the same type of "conclusive" wording President Bush and Prime Minister Blair used to justify an invasion of Iraq, and we now know how "inconclusive" those words really were! "Radioactivity is invisible, as was the case with the Chernobyl disaster in 1985, but not undetectable." This revelation goes no further, but is critical to understanding just how big a lie it truly is, as you will realize once we get further into this article. Just remember what this sentence told you; radiation emitting from nuclear devices in detectable. This Rense.com article continued, speaking of the precautions Pakistan was taking to ensure the safety of her nuclear warheads. Remember, this article was posted on December 8, 2001. After you have carefully reviewed these articles, and have studied the repeating headlines reported in NEWS1888, you will realize that Americans have been highly conditioned since the 9/11 attacks to expect a nuclear terrorist device to be used against at least one major city -- New York City -- and perhaps others. As we have stated before, a nuclear attack against a major metropolitan area is undoubtedly one of the most frightening scenarios possible. Since 9/11, this most frightening picture has been vividly painted in our minds again and again and again. As one of the articles, above, warned, nuclear devices can be hidden in any one of 18 million containers passing through our sea ports every single year. Anyone who has watched the movie, "Sum of All Fears", based upon Tom Clancy's novel, remembers how the stolen Israeli nuclear bomb was shipped into Baltimore in a container ship, loaded on to a pickup and then driven on to the football stadium concealed in a cigarette vending machine. Very impossible -- but that is the "rest of the story". "If an internal nuclear attack ever occurs in this country without a major failure of our satellite assets...perhaps we should rethink just who the enemy really is..."
These opening words are shocking, and they are intended to be. The writer wanted all of us to know that America has the technical capability to stop any terrorist in his tracks if he ever dares try to sneak nuclear weapons into this country. Let us now review the "rest of the story". "As you have probably heard from the major news networks, there is some concern about the so-called portable nuclear devices developed by the old USSR. Their former head of the KGB has confirmed the existence of 150 portable devices: 100 of which are presently unaccounted for ... none of these devices are missing; We know exactly where these devices are located at any given point in time. Did you realize our satellites had this capability? They can accurately sense the "high-velocity spin-off particles from enriched uranium", even if the device is encased in lead or buried in the earth! This capability means that we know the exact location of every nuclear warhead in the world. 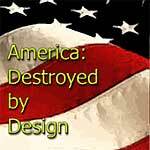 We know where every single Russian warhead is, and we knew that Saddam Hussein did not have nuclear warheads! This news is simply staggering in its implications. The current news breaking all over the world is now telling us that the British MI6 and the American CIA were guilty of massive "intelligence failures" in their pre-war assessment of Saddam's Weapons of Mass Destruction. But, this revelation tells us that such 'intelligence failure' is impossible, for we have the capability to pinpoint the exact location of every nuclear warhead on earth at any moment of time! "Rogue States" who are said to be developing their own nuclear capability would be giving up their nuclear devices quickly, for they would know that we know the location of each and every warhead. Destroying an enemy's capability depends largely on several factors: 1) Knowing the exact location of the target; 2) Having the weapons that can destroy the targets before the enemy can move them; 3) Possessing weapons accurate enough to destroy the target. Our satellite capability to sense even minute high-velocity particles emanating from even the smallest nuclear device gives us the most important factor of all: Knowing the exact location of the target. Since this information is so unbelievable, are there any other sources to which we can turn to gain verification? As President Reagan used to say often, "Trust, but Verify". After revealing the terrible possibility that Osama bin Laden might now possess nuclear suitcase devices and might be storing them in Afghanistan, the article then states a shocking reality is a most dead-pan manner. But, it does verify the story, above, that our satellites can sense high-velocity particles coming from nuclear warheads. ""[Osama bin Laden's terrorist network] Al Qaeda is trying actively to obtain radioactive and or nuclear weapons grade material," said Steinhausler. "In terms of probability of threat, I would put the nuclear bomb rather low. I would put the radioactive dirty bomb, much, much higher." A so-called dirty bomb, a conventional weapon laced with radioactive material, would make a scene like the attack on the World Trade Center even worse, Steinhausler says ... Over-flights by special surveillance aircraft of the bin Laden training camps in Afghanistan have not picked up the presence of any radioactive materials." Did you catch the significance of that last sentence? "Over-flights by special surveillance aircraft of the bin Laden training camps in Afghanistan have not picked up the presence of any radioactive materials." Not only does this ABC News report verify that America has the technological capability to locate nuclear warheads by picking up their emanations, it also tells us that this capability is located on "special surveillance aircraft"! This uranium sensing capability is not confined to satellites, but is also placed on aircraft! This capability means that, if any dirty terrorist organization started to move a nuclear device toward America, our sensing capability would immediately pick up that movement. If a suitcase bomb were ever placed on a vehicle that started moving down any freeway or back roads in America, our sensing capability would immediately record that movement, allowing instant interdiction to occur. But, we have even more sources to which we can turn to verify this shocking capability. During November - December, 2001, India and Pakistan were moving forces into position to fight a major war, a conflict which experts warned would turn nuclear quickly since Pakistan could not stand toe-to-toe with India very long using conventional weaponry. If you review Daily News Updates during this period, you will discover stories in which both countries actually bragged about how quickly their nuclear weapons would prevail. India and Pakistan seemed eager to fight a nuclear war. "An elite American military unit is preparing for possible incursion into Pakistan in order to steal its nuclear weapons arsenal, it is reported today. The special forces unit is training with Israel's most trusted anti-terrorist unit, and would be called into action in the event that Gen Pervaiz Musharraf lost power in Pakistan, the New Yorker magazine said ... intense planning was going on for the 'exfiltration' - theft - of warheads." This type of action to steal the nuclear warheads from Pakistan is not even remotely possible unless you can pinpoint the exact location of each warhead. But, we now know that our forces have the technological capability to do just that, do we not? Even though the article later raises the doubt that we can know the exact location of each warhead, the cat is out of the bag as far as I am concerned. The core of this story would not have been remotely possible unless we did know the exact location, by our special surveillance satellites and our specially equipped aircraft. Fox TV (FX) movie, "Meltdown", aired on Sunday, June 6 and again Thursday, June 10, revealed the satellite capability to sense uranium high-velocity emanations. Let us review the story quickly, as we reported in NEWS1930. As the movie unfolds, a decision is reached fairly early that elite SWAT type commandos will quietly enter the grounds of the nuclear power plant which "terrorists" had seized. The plan was to locate and kill each terrorist before they could trigger the reactor core into a meltdown. The camera follows the commandos as they enter the grounds of the nuclear power plant. The commandos are moving forward without resistance and are shown to be deep inside the grounds. Suddenly, their alert badges which pick up any dangerous levels of radiation begin to sound loudly on the lapel of each commando. Believing they were being pounded with high levels of potentially dangerous radiation, the officer in charge orders his men to quickly retreat. Both the Colonel in charge of the operation and the FBI agent in charge are stunned. They were extremely concerned that the terrorists had released radioactivity into the air as the commandos were approaching; if this were true, civilians living around the power plant were in extreme danger. Suddenly, though, as the Colonel was conferring with his lower leadership, the FBI agent abruptly intrudes, carrying a photo of the power plant from satellites up above. The FBI agent demands to know how the radiation sensor badges could be going off on the uniforms of each commando when satellites above the plant had picked up absolutely no radiation coming from the power plant whatsoever. The technology to sense radiation emanating from each warhead on earth is apparently very real, very operational, and so well known that the screen writers for this Fox TV movie understood the capability very well. Is the "cat out of the bag" yet? 1. Every suitcase terror warning ever issued -- including this most recent on July 14, 2004 -- are completely, absolutely boldface lies! 3. All these high-level stories alleging "Massive Intelligence Failure" are completely false and totally staged! With this technologically capability, it is absolutely impossible for MI6 and the CIA to make mistakes like they are accused of making. Both these intelligence agencies would have known with 100% certainty that Saddam did not possess nuclear weapons. President Bush, Vice President Cheney, Secretary of State Powell, Prime Minister Blair and his entire leadership are likewise shown to be deliberate liars. The mask is now off. We know now that our original stories warning that Bush and Blair were invading Iraq based on a thin lie were absolutely correct. Spread the word: all these terror stores are nothing but lies. This deception is so very great that we are seeing Matthew 24:6-8 and 24:24 are coming true on a daily basis in our Daily News. Truly, the End of the Age is upon us. Are you spiritually ready? Is your family? Are you adequately protecting your loved ones? This is the reason for this ministry, to enable you to first understand the peril facing you, and then help you develop strategies to warn and protect your loved ones. Once you have been thoroughly trained, you can also use your knowledge as a means to open the door of discussion with an unsaved person. I have been able to use it many times, and have seen people come to Jesus Christ as a result. These perilous times are also a time when we can reach many souls for Jesus Christ, making an eternal difference.